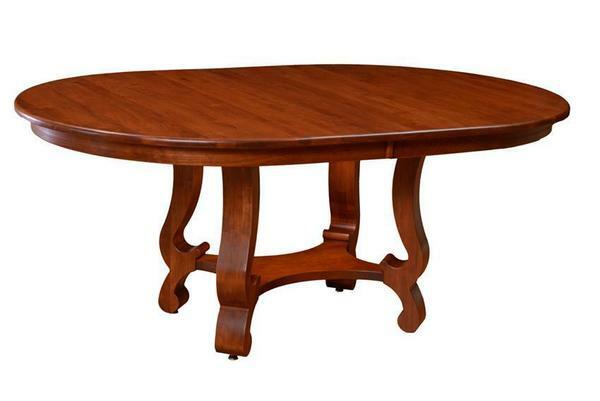 Host all your favorite guests around this elegant Arlington Pedestal Dining Table. Add up to four extensions to make space for that large guest list and clean up just as easily with extension leaves that self store. This elegant Pedestal Table is handcrafted by our skilled Amish Craftsmen ensuring superior quality and durability. Available in a variety of sizes, woods and finishes to compliment your space perfectly. If you are looking to complete your new dining room set then pair this beautiful Arlington Pedestal Table with either the Arlington Slot Back Chair or the Arlington Slat Back Chair. This stunning Amish handcrafted pedestal table is shown in rustic cherry wood with our OCS 108 stain. Call to receive finish samples or order the table as shown.